The model of my Oakdale Lumber Company is loosely based on the Tulare Lumber Company in Tulare (pronounced too-lair-ee), California. They were in business for several years but all I have is one photo of the operation which is that displayed here. Also, the company was clearly depicted on the Sanborn maps of the late 1800s showing the layout of the plant. For the model, I used the office design but made it a little smaller (two windows instead of three). I only had room for the one lumber storage shed so the whole facility is a bit smaller than the Tulare company. You can see the Lime House on the plan which gave me the idea to make my own. 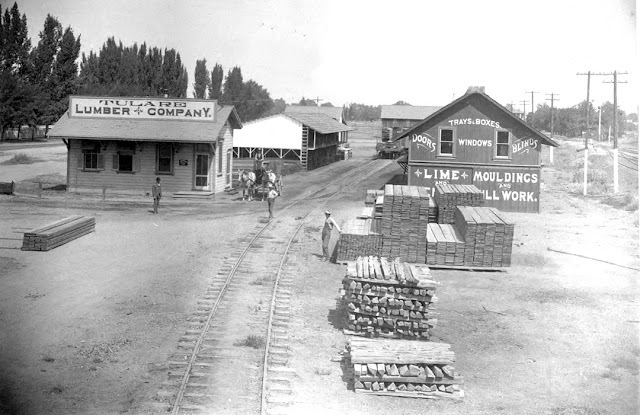 Oakdale Lumber with the office on left, lumber rack in center and the cement shed at the right. 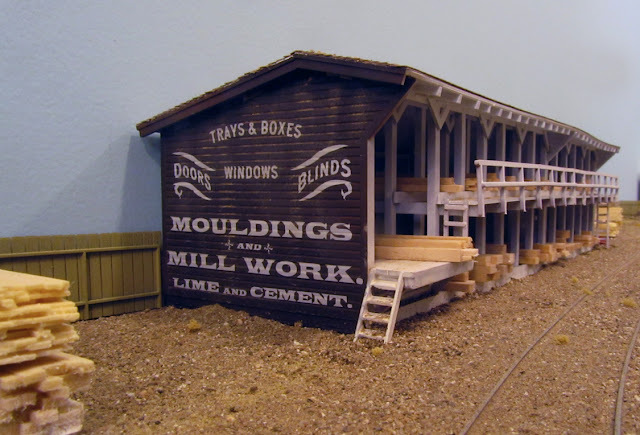 My plan called for the Oakdale Lumber Company be served by one of the sidings in Oakdale. As my scenery moved toward the southern part of the town, it became time to build the structure. I decided to join two Atlas lumber yards together to get a large enough facility to be served by rail. The modification was straight-forward, just joining the two lumber rack structures together. A new roof was made with styrene sheet and deformed slightly to create a sag which might indicate an older building. 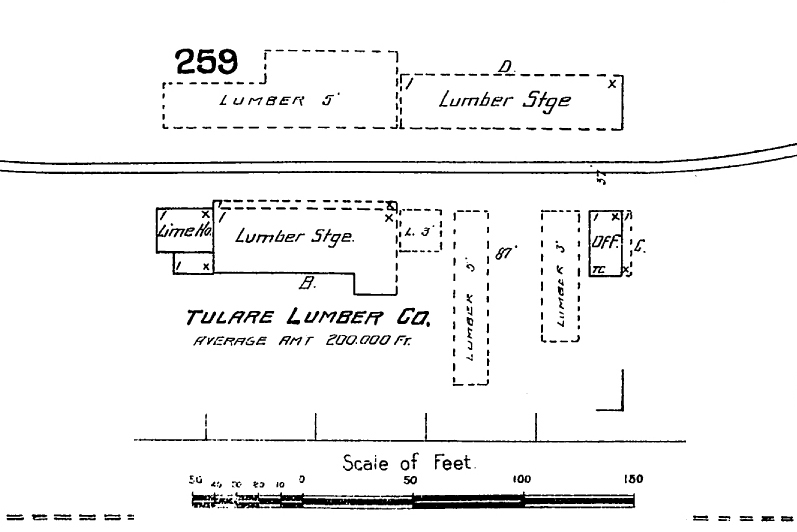 I had seen a photo of the 1890s Tulare Lumber Company and was attracted to the lettering indicating the products sold. I just had to duplicate that for this building. 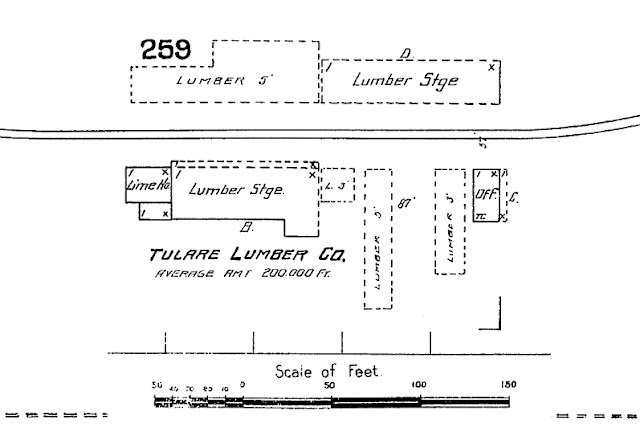 The building end lettering was copied from the Tulare Lumber Company of the same period. The lumber racks were stocked with lengths of stripwood I had on hand glued together. The Lime and cement building stands at the far end of the siding. 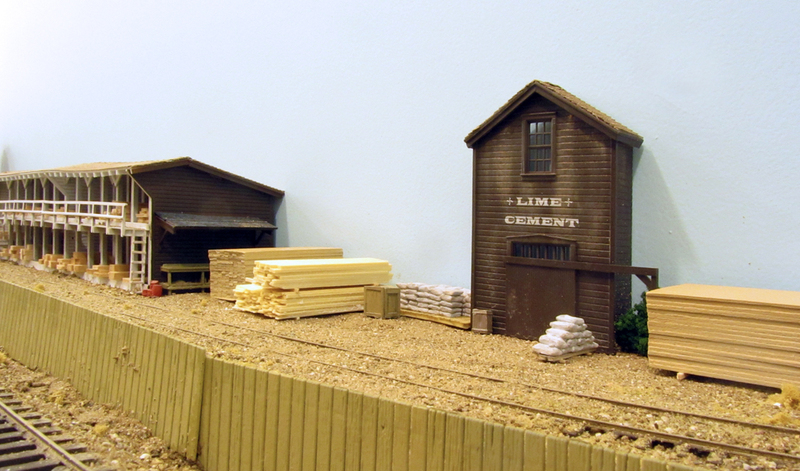 Since the lumber yard sign shows cement and lime sales, I built a small building flat to use for the storage of these products with a few sacks outside. Remember, my layout represents summer in California and the likelihood of rain is zero. A small office was scratchbuilt and the buildings installed on the layout. 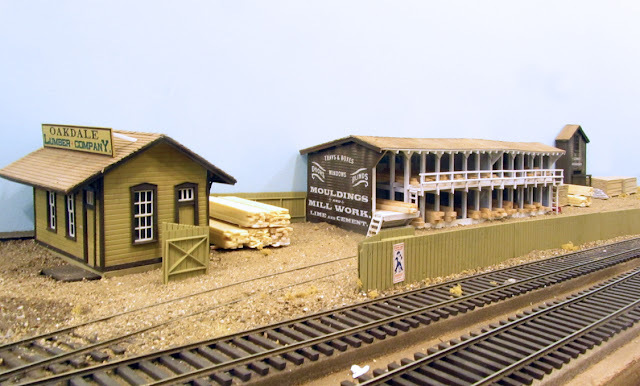 I had several resin stacks of lumber intended for flat car loads that I glued some short 4x4s to and placed them around the property. A section of fence to keep trespassers out and the yard was completed. The original wooden swing bridge over the Yukon River still is in use in Carcross. There's been no work on the S&C for the last couple of weeks. My wife and have been on an Alaska cruise. The highlight of last week was the trip over the White Pass & Yukon Railroad from Carcross, Yukon Territory to Skagway, Alaska. This 67-mile ride was spectacular. As most of you probably know, the 3-foot gauge railroad was built in 1898-1900 as a reaction to the gold strikes in the Klondike. When the 1901 steel bridge was bypassed in 1969, the railroad drilled tunnel and erected this trestle. Note the water barrels. A typical train on the WP&Y. 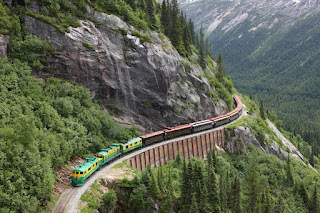 From the wharves at Skagway, the railroad climbs along a roadbed blasted out of the solid rock rivaling any Rocky Mountain railroad. Significant wood trestling is still used in several spots. The ride even had a stop for lunch at a railroad eating house, something very reminiscent of nineteenth century pre-dining car railroading. Although the locomotives were diesels, the coaches certainly went back to the 1800s. We rode in a coach of unknown parentage built in 1889. Apparently the line bought up used equipment from narrow-gauge railroads being abandoned to provide the needed rolling stock. Crossing the Skagway River near Skagway. According to the conductor, there are five trains scheduled for a short trip in the morning and another five in the afternoon with only one going the full length of the road. All dispatching is done by track warrants in the U.S. and by a similar system (OCS) in Canada. Although there was no modeling done, it was a great trip and a great cruise.